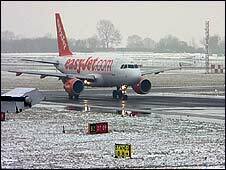 Bristol International Airport in north Somerset has reopened for a limited number of flights. The airport bus service has also restarted but only picking up from Temple Meads and the bus station. Police have advised people not to use their cars as many roads, including the A38 around the airport, have been described as impassable. The snow has also affected the M5 northbound between Clevedon and Avonmouth where only one lane is open. The Bristol International Flyer coach service between Bristol and the airport was suspended earlier on Friday but resumed service with the first coach leaving Bristol Bus station at 1500 GMT. Both the 330 and 331 services will be unable to stop at Clifton locations however both services will stop at the bus station and Temple Meads railway station. The M48, Severn Bridge re-opened at 1540 GMT. Many drivers had been stuck for up to six hours. The M4 Second Severn Crossing (SSC) remains closed due to ice falling from the top of bridge structures onto cars, making conditions very dangerous. Currently the SSC is being inspected to see when it can be reopened. The Highways Agency has advised drivers to avoid the M5 southbound at Avonmouth where another 15cm (6ins) of snow is expected. Gritting lorries were out in the city but were said to be having little impact and snow ploughs have been working to keep main routes clear since early morning. Bristol City Council said it had 200 tonnes of salt remaining which, under normal circumstances, would last a third of the winter. A council spokesman said it had ordered a further load but was not experiencing shortages as reported elsewhere in the UK. "We are relatively confident that we have sufficient supplies to cope with the predicted weather conditions," he said. 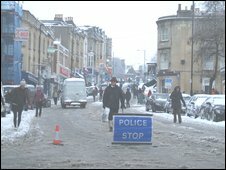 Bristol City Council is advising drivers to take care on the roads. Bridge Valley Road is closed due to a fallen tree. Whiteladies Road in Clifton is "extremely difficult to navigate". Traffic on the A420 has been delayed due to a heavy goods vehicle becoming stuck at The Fountain junction of Church Road and Summerhill, St George. Great Western Trains said most train services were running as scheduled with no cancellations and minimal delays. People travelling to Weston-super-Mare or London may experience short delays as one train to Weston had to be cancelled earlier. The Severn Beach line is closed. All lectures at the University of the West of England were cancelled and a planned open day on Saturday has been postponed. As heavy snow fell on Friday morning several schools took the decision to close. In Bristol, 127 (out of approximately 170 schools) were closed. All schools in the Bath and North East Somerset area and South Gloucestershire were closed. Waste collections have been suspended in Bristol for a second day. The city council said it would try to clear the backlog of refuse and recycling collections (black box) on Saturday. Food waste recycling collections (brown bin) have been suspended until next Wednesday.